Our First Holy Communion programme began with the children learning about Baptism, and then the call of the first disciples who ‘at once’ left everything to follow Jesus, and compared them with the rich young man who wouldn’t leave his wealth behind and consequently ‘went away sad’. 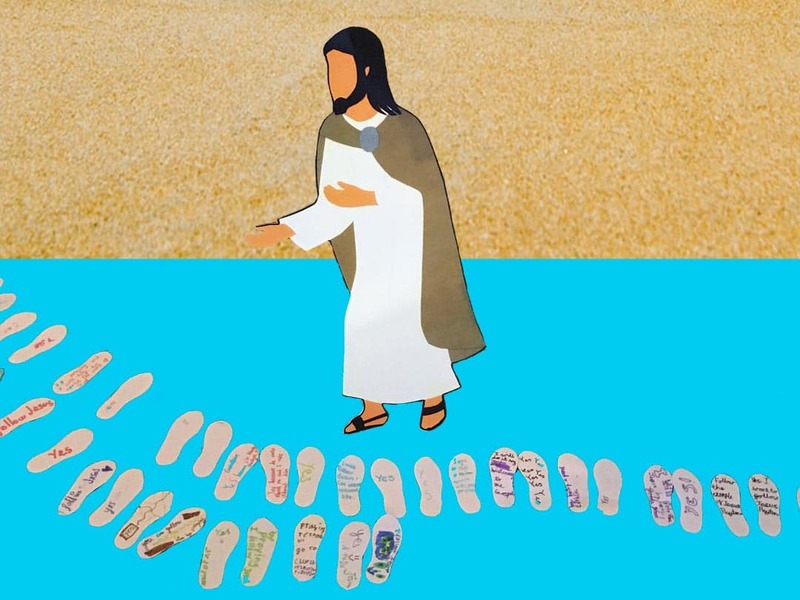 They draw and cut out their footprints, and wrote on them the individual ways in which they would follow Jesus as His Disciples. Each session begins in Church where the children arrive early and can ‘go anywhere and do anything’ on the one condition that they are silent. This works wonderfully well in developing the knock-on effect of children (and adults!) learning to respect the church as a place of silence – to talk to God, not one another, and to discover all the beautiful and interesting aspects of the interior of their parish church, about which they are then encouraged to ask questions. A 9.15 there are opening prayers in front of the tabernacle, and an explanation from Fr Peter about something in church which relates to the topic of session. At 9.30 the children go to the the halls to follow their programme with Br Andrew, Br Francisco, Mike and Alison Davis and their Assistant Catechists. Parents meanwhile have their own adult catechesis, covering the same topics as the children at a deeper level and also looking looking forward, so that they are a jump ahead of their children. Please pray for our First Communion children, their parents and carers, our Catechetical team, and others on Faith-develoment programmes in the Oratory Parish.